John Robert Boyd was born on 30th July 1933, won gold and silver at the SAAA championships, set a national half-mile record and won in a British vest – and yet very few in Scotland could tell you anything about him if they were asked. His first major medal was won in the SAAA 880 yards held on 2nd July, 1957. The title was won by JV Paterson in 1:53.1 while Boyd was second in 1:54.1 with J McNally (Doon Harriers) finished third in 1:55.0. Most races being handicap races, which had the virtues of providing hard races for all types of runner whether they were evenly matched in terms of ability or not, he did not have too many first places but on July 20th he won the half-mile at Gourock Highland Games in 1:55.7 off a mark of 8 yards to beat W Morrison of Larkhall, off 22 yards. The ‘Glasgow Herald’ described the race: “JR Boyd (Glasgow University) was the backmarker in the open half mile, but he took the lead in the last lap, and won easily in the time of 1:55.7.” But the best race of the year for Boyd – maybe even the best of his career – was one in which he finished fifth. It was at the Rangers Sports on 3rd August and the report from the Glasgow Herald tells the whole story. The actual half-mile result was: 1. JR Boyd; 2. T Cox (AAA); 3. H Haus (Holland). 1:50.8. He followed this on 9th August with a run in the invitation 1000 yards at the Edinburgh Highland Games. The report read: M Blagrove (Ealing and England) and JR Boyd (RAF and Scotland both broke the 1000 yards record of 2 min 11 sec held by C Beetham of the USA for 19 years. Their times were 2 min 10 sec and 2 min 10.9 sec. No doubt Boyd will be credited with a native record.” Coming as it did so soon after the Empire Games in Cardiff there were many very good Games athletes on display – we need only mention Peter Radford in the 100y, Milka Singh, John Salisbury and John Wrighton in the 440y, George Kerr, Mike Rawson and Mike Farrell in the 600 yards, M Lincoln, D Ibbotson in the Mile, Basil Heatley, John Merriman and Onentia of Kenya in the two miles to give some idea of the standard which went all the way through the track programme and the field events were every bit as good. If Edinburgh was the most glamorous Highland Games, Cowal was the best attended and it was there on 30th August that Boyd ran in an invitation mile. Billed as an attempt on the Scottish record by Graham Everett, it narrowly missed the target although it was won by Everett in 4:07.5 with Bert McKay (MYMCA) second and Boyd third. Donnie McDonald of Garscube was the early pace-maker and took them through 440 in 58.5 and 880 in 2:01.4. At this point Everett took the lead and came through three-quarters in 3:04.6. Given that the existing record stood at 4:06.6 he looked as though he could get the record but the wind became strongerand slowed him to a 62.9 last lap, leaving him 0.9 outside. Boyd, no doubt because of the RAF connection, did not race in Scotland very much in the early part of the season but had a very good late season. When the SAAA championships came around at the end of June, he was favourite to win the title. He did – but John Wenk, an Anglo Scot, gave him a harder fight than everyone expected and finished only a couple of yards down – see the picture at the top of the page. His time in the RAF may have come to an end by now for he was running in the colours of Ayr Seaforth AAC. Every eighteen year old had to do two years national service, most serving in the Army although those in ‘reserved occupations’ could have a deferment until their training was complete. Back to 27th June – Boyd won in 1:54.2 from Wenk with Neil Donachie in third place. A week later, 4th July, Boyd won the East v West inter-area match at Scotstoun from Neil Donachie in 1:54.3. On 11th August at the White City Boyd, now running regularly in the Seaforth vest, qualified for the final of the 880y by only 0.05 of a second but made nothing of it in the final, finishing seventh in a race which had a very slow first lap and a much faster ‘burn up’ on the second. Keddie in his centenary history of the SAAA suggests that Boyd’s run in the GB ‘B’ International at St Helen’s on 25th July was his best ever race. The match was against Holland and he won in 1:52.4 a faster time than he had done in the SAAA. His season continued to the Edinburgh Highland Games on 22nd August where it drew to a close when he finished third in the 880 yards behind McClean of Ireland and John Wenk. 1959 had been a fairly good season with an SAAA title, a win for the British B team and best times of 51.4 sec for the 440 which placed him 20th in Scotland and a best 880y of 1:52.4 which placed him second. There were no marks for Boyd in the ranking lists at the end of 1960 and he did not appear in any of the championships or major Highland Games or sports meetings although he was in action in the following summer. On 29th April, 1961, the new track was officially opened at Dam Park in Ayr and, as a member of the local club, Boyd turned out in the half-mile. He won from fellow Seaforth member Jack Davidson in 1:58.5 with J Brownlie of ESH third. Boyd won his first championship medal for some time on 27th May at Westerlands in the West District championship half mile and finished third behind Willie Morrison of Larkhall YMCA (1:58.1) and Bill Black of Maryhill. His place as the Ayr Seaforth half-miler seems to have been taken by Jack Davidson who won many races over the summer, including most inter-club fixtures. Nevertheless by the end of the year, Boyd was credited with an 880 in 1:56.2 which placed him 16th in the rankings. He was a good club man and is reported to have run in many relays at this point of his athletic career. In 1962 he even turned out in, and was ranked nationally in,the 440 yards hurdles. If he turned out in the inter-club fixture with Edinburgh Southern Harriers on 28th April, he did take first place in any event but the word is that he probably did run. The middle distance races were won by Ken Ballantyne and George Brownlie of ESH in 1:55.5 and 4:22.1. He certainly took part the following week in an inter-club against Shettleston at Seedhill, Paisley, where Ayr won with Boyd taking the 880 yards in 2:01.2. Ayr, as was almost habitual, both relays too. However in the match against Victoria Park at Dam Park on 19th May, while the middle distance events were won by Ayr Seaforth the men concerned were Jim Wilson and Jim McLatchie in 1:58 and 4:22 respectively. This time Ayr won only the 4 x 440y relay with the shorter event going to VPAAC. Victoria Park won by only one point – 99 to 98 – and it is interesting to note that there was a Six Miles event on the programme, won by Bobby Calderwood of the Glasgow club in 32:00.4. Unplaced in the SAAA championships at the end of June, he was also absent from the results sheet on 7th July for the medley relay at Ardeer where the 880y man for the A Team was McLatchie and for the B Team, J Wilson. At that time apparently Jack was running mainly relays – the 4 x 440 and the sprint medley – with the well-known and respected Frank McCarvel in charge of the squad. Nevertheless, by the end of 1962 he had an estimated 880 time of 1:57.9 which ranked him 29th in the country for the distance and he had a run over the 440 yards hurdles which was timed at 60.5 seconds which was good enough for 19th Scot over the distance. He was not by now running as well as he had a few years earlier. Having graduated from Glasgow University at the end of the 1950’s, his career should have been really taking off by now. 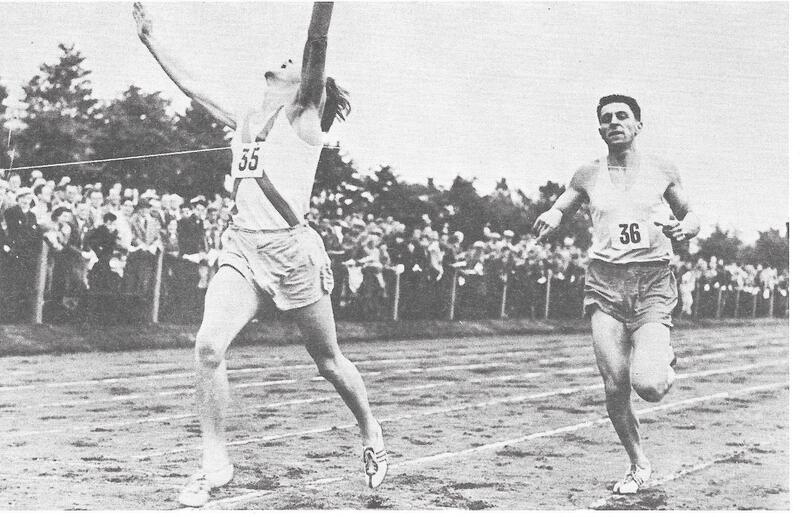 He had nothing left to prove – Scottish champion, Scottish record holder (with a time which broke Paterson’s record of three years earlier and a time which would stand for seven years) plus very good performances for Britain, for the Atalanta Club and of course for Ayr Seaforth, he had an athletics career to be proud of.